We have all heard about the perils of the obesity epidemic and its cost ho society. But something you may not know is that it’s not all about willpower and the make-up of the food environment. 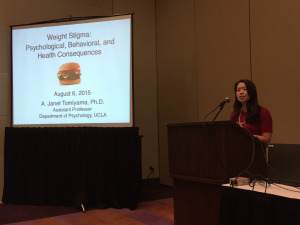 In this regard, Dr. Janet Tomiyama, an assistant professor at UC Los Angeles, gave a spirited, and impressively convincing, invited talk as part of Div. 38’s programming on the insidious role of weight stigma.